There is something about fall that I love. I think a big something about that is pumpkin spice everything! The moment pumpkin spice coffee is available I am the first one to buy the stuff and I live on it through Christmas. So when I was asked to try out the new Kernel Seasons pumpkin spice popcorn flavor and caramel flavors I was happy to do so (I love popcorn, I made white chocolate popcorn for my friends for Christmas last year – YUM!). Fall also means pumpkin cookies! I was excited when the package arrived in the mail, I got a really cool popcorn maker last year that hasn’t been used since winter. My husband drooled over all of the flavors. 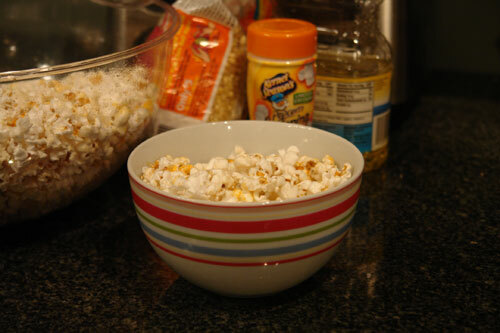 I made a huge bowl of popcorn to try them out, I lightly buttered the popcorn to help get the spice to stick. All of the popcorn quickly disappeared! The bonus is that they sent me a whole bunch of cool flavors to giveaway to one lucky winner! You can use these flavors on much more than popcorn. The giveaway ends on Wednesday, November 16th at 8:00 p.m. MST. Please make sure you leave a valid email address. The winner will be chosen randomly and this is available to U.S residents only. *The seasonings were given to me free by Kernel Seasons and this giveaway is being provided by Kernel Seasons, but my opinions are my own. 11/16/11 – Using http://www.random.org to determine the random winner, the winner was Barbara! I will contact you to deliver your prize!. 9 Comments on "Fall Flavors for Popcorn and Kernel Seasons Giveaway"
WOW! I love these!! My fav is the sour cream & onion flavor…I buy it from Amazon because my local stores don’t carry that flavor… but I would love to try some new flavors! WOW! I love these!! My fav is the sour cream & onion flavor…I have to buy it from Amazon because my local stores don’t carry that flavor… but I would love to try some new flavors! what a great giveaway…would love to win…we love popcorn! Thanks Katrina, you have been entered! Wow, what a great idea! I have never tried these, but they sound yummy! Especially white cheddar popcorn, yummmmmmummmmmy! Um, delish!! Looks awesome! Never tried them, but would love to!